There you have it. While cosying up to a collection of Wellington sycophants for a photo opportunity, Taxcindarella has made it clear that she knows what your views are, as she implicitly endorses the ‘mob veto’ against freedom of speech, being cancellation because of the threat of demonstrations. Or worse. That sort of woolly claptrap equates to something simpler and far more sinister. Viz. The speakers’ racist views (in Taxcindarella’s opinion) are not the same as our racist views, so we [who?] don’t welcome them here. More or less what Andrew Little suggests. And – of course – it’s not that NZ is hostile to free speech. No! It’s the thought police, we-know-better clowns from the W’gton drone house, and the PC-muzzled media that are paranoiac about allowing the free speech of opinions contrary to their own sacred cows. Of course, it never occurs to any of these hollow-headed numpties that an empty venue makes the loudest noise. They’re absolutely terrified of being shown to be wrong. I.e. Their blind and wilful arrogance does not allow them the courage to wait and see how just many people they do not speak for, being those who would actually attend such an event, given the choice. Yet another sad day for NZ’s slowly decaying democracy. This was inevitable with labour. So pleased I don’t live in NZ any more. Its an absolute disgrace. This rabble trying to run our country is a bloody nightmare ! Labour…”if it aint broke, break it”. Peters, you have hell of a lot to answer for. Yet, when a bunch of lying, greedy part-Maoris use hate speech saying they own NZ and all non-Maori are guests in “their” country, that is OK?! We are fast becoming the New Zimbabwe of the world. Racism, hate speech and discrimination is OK in NZ as long as non-Maori bear the brunt of it. Shame on NZ. She only got 30 something % of the votes, therefore she can’t speak for “New Zealanders”. Silly little girl. Say goodbye to a free speech NZ , only a selected few are allowed to speak their mind as long it’s in line with this undemocratic left government. ONLY THOSE WITH SOMETHING TO HIDE HAVE ANYTHING TO FEAR! That’s what governments tell us as they ever-increasingly encroach on our freedoms. Yet in reality, it is NZ governments and the racist fat-cats which have much to fear from NZ citizens hearing the truth. Hence their subversive attempts to suppress it. Freedom of speech would expose the multitude of lies of both racist governments and racist iwis. 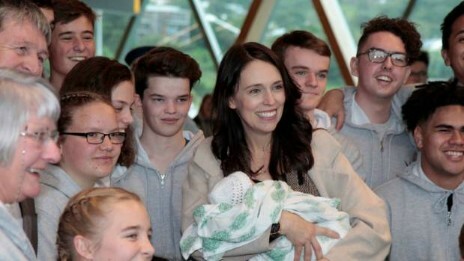 I came to New Zealand 22 years ago to escape two forms of separatism: one of the ‘apartheid’ brand – dismembered, the other an aggressive ‘affirmative action’ that creates a new underclass of citizens – alienating thousands – the future of New Zealand? Politicians have no right or mandate to deny us our freedom of speech. I believe virtually no-one would have attended the meetings and the few that may have would obviously have been racist disciples who’s views remain. Without Phil Goff’s unjustified display of arrogant censorship most people in NZ would not have known these people were visiting NZ. Our society has lost an important principle – free speech works both ways. You’re dead wrong there – their show was sold out! Maurice- You seem to think it matters what their views were! The truth is that the hardest free speech to defend contains the views with which you disagree most but these are the views for you should strive the hardest to preserve. If you mean that they have got extra publicity from the opposition to their speaking then of course you are correct. Try watching/listening to the Patrick Gower interview where he is just so out of his depth as to be embarassing. This is a NZ interviewer?? The whole thing makes me realise just how fragile our democracy is and how poor is the understanding of the very concept of democracy is in this country. Another item worth looking at, perhaps? An Irish perspective? It’s nearly 28 minutes long. If only it was as easy as blaming it on her ‘baby brain!’ An utterly stupid thing for a PM to say, immature. Do not despair, some of us are working on the problem. Anyone who disagrees with the loony left = ” right wing racists”. The gullible uninquisitive lazy media are a joke in this country. With the forced shutdown of Molyneux and Southern. Oh, they will take note alright. Up in arms, vocal, then, “oh I see 50 inch flat screen TVs are on sale this week Cheryl, we must go to Noel Lemmings”. As New Zealander’s we need to stand up and show Local Govt and the standing Govt. politicians that we have had enough of being spoken for on their behalf. Maori are rough riding into power at all levels and we are fast becoming another Zimbabwe if you stand up and be counted for. Freedom of speech was fought for by our Grandparents (First World War) and our Parents in the (Second World War) and skirmishes there on since.